Leonard, Eileen, Henry William Stebbings, Eva, Ethel Florence Stebbings nee Riddick. Benjamin Stebbings (1812 – 1881) and Elizabeth Stebbings (1823-1901) migrated to New Zealand from England, arriving in 1860. 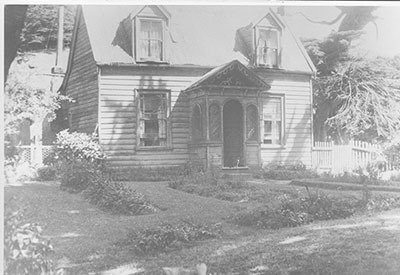 They came to live at The Halfway, now Glenside, in 1863. Access to their home was up Stebbings Road. At the confluence of two streams, the road turned to the right across a small bridge. These days, Stebbings Dam has been built across Stebbings Road and the little bridge upstream of the dam is overgrown with blackberry. At the bridge the road diverged. The upper track was Stebbings Road and took people to the Stebbings farmhouse. The lower track, named Morepork Valley Road, was constructed early in the 20th century and continued up Stebbings Valley through the family farm, ending in the middle of a paddock. 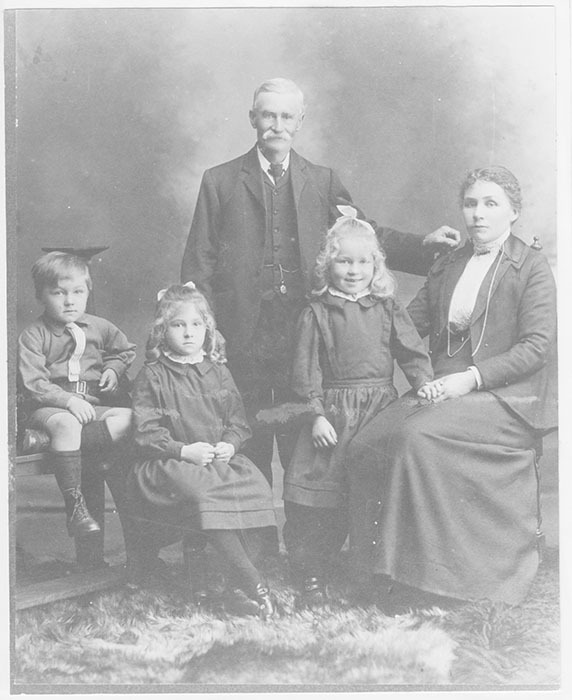 Benjamin and Elizabeth had one child, Henry (1845-1922) who married Ethel Riddick (1874-1951) in 1906. They had three children, twins Eva and Eileen (b1907) and Leonard (b1909). The Halfway House Heritage Garden Group is planting an orchard in the grounds of the historic Halfway House, with fruit trees that were named in the original Stebbings Orchard. The following writings are extracts from “Memories of Pine Hill” by Eva Samuda nee Stebbings. Her memories were published in The Onslow Historian, Volume 22, in 1994. This booklet can be purchased from the Onslow Historic Society, Khandallah Automatic Telephone Exchange, 86 Khandallah Road, Khandallah. Open Sunday between 1-4 pm. Eva describes there being two orchards, an upper orchard and a lower orchard and she recalls there being about 70 trees. She also writes of fruiting currants, mushrooms and remnants of the original Riddick garden. “Pine Hill was a wonderful place for three young children and shearing and haymaking were exciting and busy periods of the year. Shearing started in the first week of November and meant Christmas was near; and haymaking started in December after the wool bales had been taken to Abraham and Williams’ store in Kaiwharawhara. Haymaking meant one thing and one thing only to three small children. APPLES!" “In the lower orchard grew three large Irish Peach apple trees. By late December the apples were ripe and sweet and as soon as the hay was cut in the lower part of the orchard we would dash down and collect the windfalls and bird-pecks. This we did every morning until the trees were picked, the first arrival collecting most of the juicy “loot”. I remember many of the names of those early apples in the two orchards of Pine Hill. I suppose there were 70 trees all counted. Yorkshire Greening (later called Alfrieston) was a wonderful cooking apple. So too, were Codlin and Brabrant, the latter also being very sweet and juicy. Maidens Blush and the enormous Peasegood, Jennington and Northern Spy , Mayton’s Red and the lovely brown Russets all come to mind, but it was the apple Tom Putt that we children truly loved and oddly enough I came across its name in a book on early Marlborough which I read recently (1987). Tom Putt was to us the perfect apple. It was rather flat and where the flower head had fallen off five odd little weal marks converged like quaint tear drops. Its colouring was magnificent – a bright, flowing red – and its flavour out of this world The most intriguing part to me, however, was the pinkness of the flesh which penetrated the apple for a good quarter of an inch. One wonders why some of those apples lost their popularity." “The apples at Pine Hill were a boon to mother at shearing time. Though the new season’s crop was not ready there was always a case or two left of the winter keepers, the dark purple-red Beefington and the green New England Pigeon. These apples were hard as bullets and had very little juice but kept wonderful well and were excellent for cooking. In the days before home refrigeration they were a great blessing to the farm cook." “At the end of the present Stebbings Road as one turns toward Pine Hill there used to be a small cottage. It was in the cow paddock and the site of the excavation is probably still there." “My maternal grandparents lived in this cottage for a while, and it was the home of my mother as a small child. The cottage was owned by grandfather Benjamin Stebbings and the site was always a special place for me." “There was always a sort of romantic aura about it. In the corner by the road grew a tall black poplar and along the northern fence was a sturdy privet hedge. In the hedge grew a delightful little tea rose and it was my great joy to pick its flowers every summer, especially at Christmas time when we were walking home from school at the beginning of the summer vacation."